This page is the gateway to a variety of topics related to the core technology that powers SEVEN Networks Open Channel products, along with additional technology topics of carrier interest within the mobile traffic management and optimization domain. As wireless carriers seek to fully monetize finite mobile network resources, they cannot afford to allow those resources to be wasted. 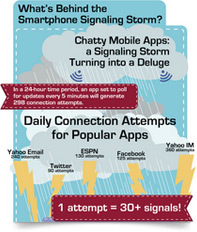 Background activity from chatty apps creates network congestion, wastes bandwidth, and drains device batteries. The Open Channel client extends mobile traffic management and optimization to the source of data traffic – the mobile handset. A software presence on the handset is critical for conserving network resources and achieving network efficiency. This important element of the 3GPP standard facilitates data traffic offloading to alternative sources of wireless connectivity. Offloading helps carriers reduce costs and better manage the heavy demands placed on mobile network capacity. The Open Channel server provides a centralized platform for defining policies that govern mobile traffic management and optimization. Carriers have a choice of deployment options for the server component of Open Channel software products.